The high-flying stock got caught up in spiking market volatility last month. 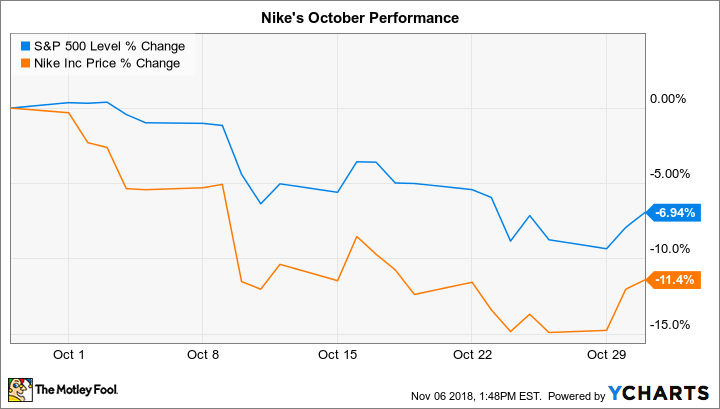 Sports footwear and apparel giant Nike (NYSE:NKE) trailed the market last month by shedding 11% compared to a 7% decline in the S&P 500, according to data provided by S&P Global Market Intelligence. The drop did little to take away from shareholders' longer-term returns, though, as Nike's 20% gain so far this year far outpaces the market's 3% uptick. With no significant news coming out of the company last month, the stock-price slump wasn't a reaction to any specific Nike trends. Instead, shares were apparently caught up in a broader market drawdown that was especially hard on stocks like Nike, which had seen market-thumping gains earlier in the year. Nike is entering a holiday-season period that's critical to management's wider growth targets. If all goes to plan, the retailer should announce faster growth in fiscal 2019, along with its first gross-profit-margin increase in three years. Successes here are allowing the retailer to speed up investments in its attractive direct-to-consumer business, which, in turn, should pave the way for higher sales well into the future. Investors are better off focusing on those operating trends and doing their best to ignore short-term pricing swings like these.